After realizing that Brian’s color blindness was frustrating the painting process, I suggested he paint with a limited palette. He had never considered this. It allowed him newfound freedom to enjoy, as he puts it, “the fun part of painting” without having to keep track of what color went where. He started by limiting the palette to blue and yellow–basically, the red-green “color blind” palette (see my previous post for a full explanation). This immediately lifted the red-green color confusion he’d struggled with in earlier paintings. Perhaps these yellow and blue limited palette paintings allow us to approximate seeing the world through his eyes. The color-blind friendly range of blue and yellow offers the distinct, deliberately-designed look that comes with any limited palette. Wes Anderson’s carefully coiffed color schemes are well-known, and artist James Gurney, who has also written about color blindness, discusses the benefits of limited palettes in creating unified moods. Brian’s latest work has focused on a construction site across the street from our studio; the recently-demolished buildings that once stood on the site used to house our friends at Rise Above Graphics. He started out the series with a few dozen daily paintings of the lot with a close-to-color-blind palette of yellow, blue, and brown. Though there’s some green (from mixing blue and yellow) present, these paintings are close to “seeing the world through red-green color blind eyes”. His next paintings of the same location incorporated the idea of limiting the range of hues, but brought back colors outside the “color blind palette”. Any limited palette can allow a red-green color blind person to paint with reduced confusion. The only caveat is that only ONE of any pair of easily confused colors can be present. Red and green can’t be on the same palette, nor can purple and blue, grey and pink, or orange and red. Animated GIF showing palette limited to red and blue. Red-green color blind simulation turns on and off. When the color palette is shifted away from the “color blind friendly” blue and yellow, the painting reflects reality only to red-green color blind people, and looks quite unusual to the those with normal color vision. In his most recent paintings of the same empty lot, Brian has shifted his palette to red and blue, and can paint just as easily. To a red-green color blind person, the colors in these red and blue paintings do not look nearly as different from than the yellow and blue paintings of the same empty lot. Animated GIF simulated how two distinct kinds of “limited palette” paintings look similar to each other when a red-green color blindness filter is applied. 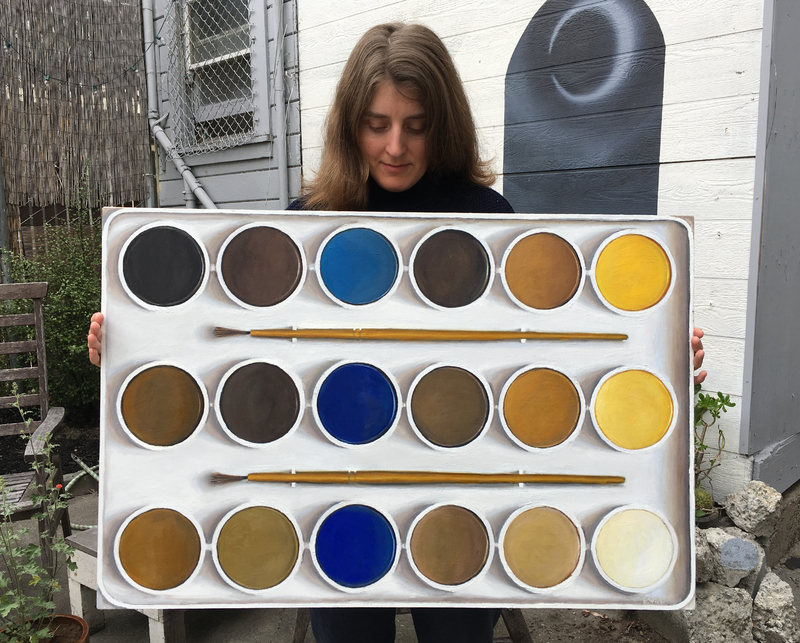 These shifted palette paintings can serve as a crude color blindness test. Without a red-green color blindness filter, the paintings on the left show a realistic, albeit limited, range of colors, and the paintings on the right show unusual false color. With the filter, all four paintings appear to spring from a similar palette. Now that Brian is more aware of the difference in color vision, does he ever continue to use a full palette? Yes. Particularly with pen and ink watercolors, where he doesn’t have to re-mix any colors. Brian Brooks, Cool Trees After A Trimming, 2015, Watercolor on paper, 3 x 4.5 inches. Animated GIF turns red-green color blind filter on and off. Brian Brooks, Bad Trees After A Trimming, 2015, Watercolor on paper, 3 x 4.5 inches. Animated GIF turns red-green color blind filter on and off. Brian Brooks, Sad Trees After A Trimming, Watercolor on paper, 3 x 4.5 inches. Animated GIF turns red-green color blind filter on and off. Brian Brooks, Fun Trees After A Trimming, 2015, Watercolor on paper, 3 x 4.5 inches. Animated GIF turns red-green color blind filter on and off. I hope this post has taken you on cool, bad, sad, and fun journey.